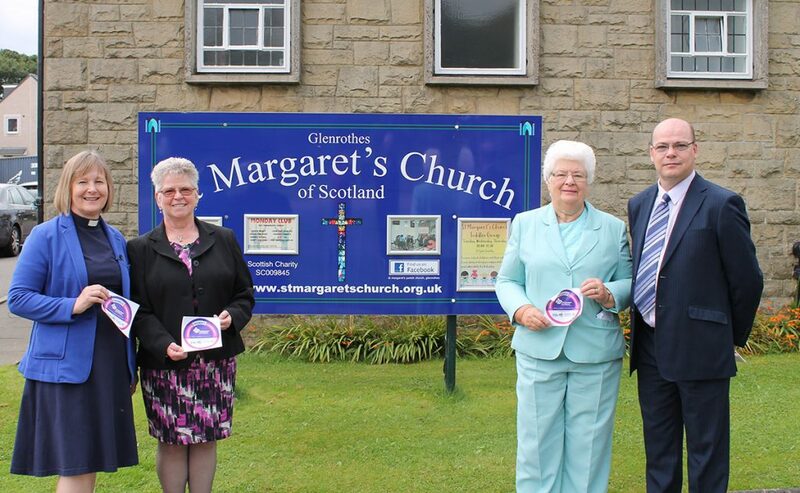 St Margaret’s Parish Church in Glenrothes has been honoured with the ‘Dementia Friendly Glenrothes’ award from Alzheimer Scotland, which was presented at their monthly All Age Celebration Service on Sunday 2 September. The accolade was bestowed on them for their work to improve accessibility in their church for those with dementia. Rev Eileen Miller of St Margaret’s Parish Church, Ruth McCabe (Alzheimer Scotland), Wilma Craig (an Elder in St Margaret’s and the church’s Dementia Friendly contact person) and local councillor Derek Noble. From left to right: Rev Eileen Miller of St Margaret’s Parish Church, Ruth McCabe (Alzheimer Scotland), Wilma Craig (an Elder in St Margaret’s and the church’s Dementia Friendly contact person) and local councillor Derek Noble. As the first church in the area to receive the award, it is a significant achievement and one that the minister, Rev Eileen Miller, is very proud to receive. Dementia affects approximately 90,000 people across Scotland and by 2020 it is estimated that there will be over 1 million people living with the illness in the UK. Mrs Miller and her whole church team have worked very hard on making the building and its services accessible to congregational members with dementia. Physically, the church, the halls and group spaces needed some changes to become dementia-friendly. This involved lots of new signage both inside and outside. The minister and her team also invested an hour of their time to be trained as Dementia Friends. Mrs Miller said: “We are a church that is called to serve people of all ages in our parish, which covers Woodside and Pitteuchar. “This is reflected in the groups that take place in the church every week such as Toddler groups, Monday club, Rainbows/Brownies/Guides, the Guild and the Good Companions (a friendship group for older people). “It seemed obvious that a busy church should make the small but targeted changes necessary to allow those living with dementia to find their way into and around the building with confidence. Local councillor Derek Noble was also in attendance at the worship service on Sunday for the award presentation. “Our mission is to help improve daily life for people living with dementia and for their carers, and to change the way local people think, talk and act when it comes to dementia. “By becoming a dementia-friendly church the team now have the awareness and confidence to help make a difference to their congregation and the people who use the groups and activities who are in need of extra support. Churches like St Margaret’s provide a lifeline to local people who have been active within their church and want to be able to continue to worship and go to groups and activities. The ‘Make Glenrothes Dementia Friendly’ initiative is a partnership between Fife Health and Social Care Partnership and Alzheimer Scotland. A wide range of other businesses and services in Glenrothes are involved in the initiative including local leisure centres, banks, libraries and supermarkets. The aim of the Dementia Friendly Glenrothes window stickers is to help people living with dementia to identify shops and services that have a dementia-friendly approach. This will hopefully help people who are affected by dementia to feel safe and welcome as they go about their daily activities – such as doing their shopping or meeting with friends and family. Read our Quick Guide, written by Professor June Andrews Friendly_Church_Buildings.pdf , on tips for becoming a dementia-friendly church building. Find out more about the Dementia Friendly awards and access resources and tools on how to make your buildings more dementia-friendly. Find out more about how to become a Dementia Friend.